Description Daubigny's loose, spontaneous brushwork and rich use of color provide a direct link with the work of the impressionists. Like his younger colleagues, he was also regularly criticized for producing mere "impressions" rather than more detailed, polished views of nature. This vibrantly colored scene dates from 1874, the year of the first impressionist exhibition. The Works of Antoine-Louis Barye. American Art Gallery (New York), New York. 1889-1890. An Exhibition of the Treasures of The Walters Art Gallery. The Walters Art Museum, Baltimore; Smith College Museum of Art, Northampton; Pace Wildenstein Gallery, New York. 1967. 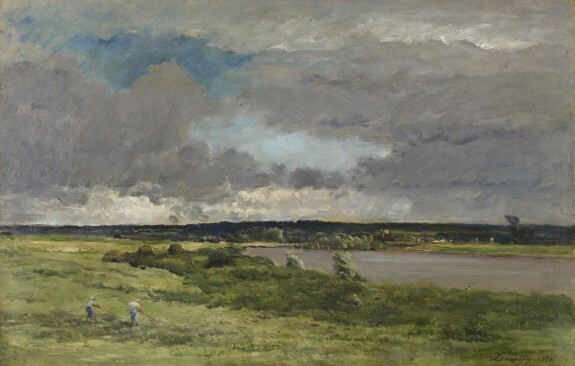 Before Monet: Landscape Painting in France and Impressionist Masters: Highlights from The Walters Collection. The Walters Art Gallery, Baltimore. 1998. The Road to Impressionism: Landscapes from Corot to Manet. The Walters Art Museum, Baltimore. 2004-2005. The Road to Impressionism: Barbizon Landscapes from the Walters Art Museum. The Dixon Gallery and Gardens, Memphis; The Frick Art & Historical Center, Pittsburgh. 2008-2009. Daubigny, Monet, Van Gogh: Impressions of Landscape. Taft Museum of Art, Cincinnati; National Galleries of Scotland, Edinburgh; Amsterdam: Van Gogh Museum, AJ Amsterdam. 2016-2017. Provenance Purchased by William T. Walters (through George A. Lucas as agent), Baltimore; inherited by Henry Walters, Baltimore, 1894; by bequest to Walters Art Museum, 1931.